Your immune system is your body’s own powerful army. It puts up an array of sophisticated defenses against threats from within and without. Studies in the United States and abroad increasingly point to vitamin D as perhaps one of the immune system’s strongest allies against disease. Now, investigations by Agricultural Research Service physiologist Charles B. Stephensen are providing new and more precise information about the amount of this essential nutrient that we may need for optimal health—including a healthy immune system. The research is timely. Millions of Americans don’t get enough vitamin D—a deficiency that some have called one of the most serious public health issues facing the United States today. Scientists have known since the early 20th century that our bodies are stimulated to make vitamin D when ultraviolet rays from the sun reach our skin. The amount of direct sunlight that we do—or don’t—receive depends on the season, the latitude at which we live, the amount of time we spend in the sun, the pigmentation of our skin, and even the kind of protective clothing we wear. We also get some vitamin D from foods, including salmon and some other fish, milk and breakfast cereals that are fortified with this nutrient, and supplements such as multivitamin tablets. For a study assessing the contribution of skin pigmentation, sun exposure, and diet to vitamin D status, graduate student Melissa Zerofsky uses a reflectance spectrophotometer to measure a volunteer’s skin pigmentation at the ARS Western Human Nutrition Research Center in Davis, California. Findings from a preliminary, and apparently first-of-its-kind, study of 72 young adult volunteers in northern California might help pave the way to individualized recommendations—for the future—for vitamin D intake. The recommendations might take into account two personal characteristics: sun exposure and skin tone. Stephensen is research leader of the Immunity and Disease Prevention Research Unit at the ARS Western Human Nutrition Research Center in Davis, California. He collaborated in the investigation with supervisory chemist Leslie R. Woodhouse, graduate student Laura M. Hall at the center, and others. For 7- to 8-week stints during spring, summer, fall, and winter, volunteers provided intermittent records of what they ate and, once a week, wore photosensitive badges from 7 a.m. to 7 p.m. to record their exposure to the sun. Blood samples were taken three times each season so that scientists could monitor the volunteers’ vitamin D levels, using serum 25-hydroxyvitamin D as their indicator. From these measurements, the researchers developed a preliminary model that first of all assumes a vitamin D intake of 200 international units (IU)—the U.S. adult recommended daily allowance. Then, the model predicts the additional amount a person might need, based on the individual’s sun exposure and pigmentation. The data from volunteers—either African-American or of European ancestry—who had relatively low amounts of sun exposure suggests that they may need additional vitamin D to reach a target blood level of 75 nanomoles of vitamin D per liter of plasma. Perhaps surprisingly, “low sun exposure” would be, for example, the amount received by a person spending no more than 20 minutes a day in direct sun, wearing long pants (not shorts), a short-sleeved (not sleeveless) top, and no hat. “That’s similar to an average office worker’s exposure,” Stephensen notes. Details are in an article published earlier this year in the Journal of Nutrition. Stephensen cautions that some of the intakes indicated by the experimental model exceed the level currently considered safe. He also notes that the findings are preliminary and that “more research, with a larger number of volunteers” is needed to refine the predictive power of the new mathematical model. Among the many foods thought to play an important role in keeping the immune system healthy are mushrooms. In the United States, white button mushrooms represent 90 percent of the total mushrooms consumed. 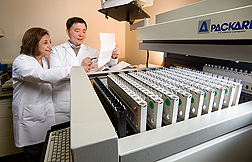 At the Jean Mayer USDA Human Nutrition Research Center on Aging at Tufts University, center director Simin Meydani, colleague Dayong Wu, and others conducted an animal-model and cell-culture study showing that white button mushrooms enhanced the activity of natural killer cells. The results suggest that white button mushrooms may promote immune function by increasing production of antiviral and other proteins that are released by cells while seeking to protect and repair tissue. Wu and co-investigators are with the HNRCA Nutritional Immunology Laboratory in Boston, Massachusetts. The study’s cell-culture phase showed that white button mushrooms enhanced the maturity of immune system cells called “dendritic cells,” from bone marrow. Dendritic cells can make T cells—important, specialized white blood cells that can recognize foreign substances from invading pathogens and eventually present them to other defense system cells. The study appears in a 2008 issue of the Journal of Nutrition. HNRCA researchers are also conducting observational studies in the area of immunology. They are studying immune response in about 600 elderly residents in 33 nursing facilities in the Boston area. Meydani and colleagues previously reported that among the facility residents, those who consumed 200 IU of vitamin E daily for 1 year were 20 percent less likely to get upper respiratory infections, such as colds, than those who took a placebo. A secondary analysis of data from the same clinical trial showed a high proportion of the residents had low serum (blood) zinc concentrations at baseline and after 1 year of follow-up. All participants had been supplemented with half of the recommended dietary allowance of essential vitamins and minerals, including zinc, during the trial. The researchers found that those with normal blood zinc concentrations were about 50 percent less likely to develop pneumonia than those with low concentrations. Those with normal zinc status also had fewer new prescriptions for antibiotics, a shorter duration of pneumonia, and fewer days of antibiotic use compared with residents who had low zinc levels. The study appears in a 2007 issue of the American Journal of Clinical Nutrition. While the study suggests that supplementation of zinc-deficient elderly may result in reduced risk of pneumonia, the authors note that controlled clinical trials are needed to test efficacy of zinc supplementation as a low-cost intervention to reduce mortality due to pneumonia among vulnerable populations who already have low zinc levels.—By Marcia Woodand Rosalie Marion Bliss, Agricultural Research Service Information Staff. "Boost Immunity With Food and Sun" was published in the July 2010 issue of Agricultural Research magazine.